Rule of Thirds in Digital Photography has been easy to follow than Film Photography due to Live Preview, opportunity of multiple shot and self post processing. Rule of Thirds is also known as The Golden Rule of Thirds and is been in use for centuries by the traditional artists, painters and is still widely used in the composition of a photograph. It is a common misconception that, Rule of Thirds is for Photography only. Historically, this idea was written back in 1618, although even many thousands years before, artists used to follow the Rule of Thirds, not with the name but is apparent from the style of composition. As usually, this article will follow our traditional way of writing, first we will discuss about Rule of Thirds and then discuss the importance and significance of Rule of Thirds in Digital Photography. Rule of Thirds is imaginary division of the image into nine almost equal rectangular or square pieces by imaginary lines and placing the subject of be photographed in one of the points of intersection of the imaginary lines obtained, it is considered that the image will be more dynamic when compared to a composition that places the subject at its center, it will be harmonic, at the same time. In other words, if one draws two horizontal and two vertical lines over an image, in a manner that all nine boxes are equal, then we can actually judge the applied rule. Rule of Thirds is so popular that some cameras have viewfinders with a grid of thirds to help the photographer. The reason why so called passport photos look so odd is due to the fact, that the eyes of the person is actually placed aiming the eyes, right in the middle. In addition to the positioning of a living animal including human, the rule of thirds is also used to evaluate the placement of the horizon in the paintings or panoramic photographs, according to the thesis that a horizon in the middle gives the same importance to the sky and the landscape effect is usually not wanted. The lines in Rules of Thirds are known as lines of force. as well as the full article on English Wikipedia on Rule of Thirds is written by him. Any Photographic composition consists of deliberate arrangement of elements in a scene. The goal is to select and arrange the elements in a harmonious way to communicate ideas and impressions to the viewer to emulate a real feeling to be processed by the brain. The composition is an important part in drawing and one of the major elements in photography. On many points, the photographic composition is based on composition rules in painting. Space on the image used for illustration of the perspective, the spatial arrangement of the objects in the image, the depth of field, Bokeh effect, Blur effect and all the methods that give the impression of depth on a two-dimensional image. Line or direction followed by the eyes when reading the image by the eyes and interpreted by our brain. The artist determines the point focus point of his or her work and deploys the function. The viewer’s eyes should spontaneously move toward these points of attention. In addition, the image must be a meaningfully harmonious. 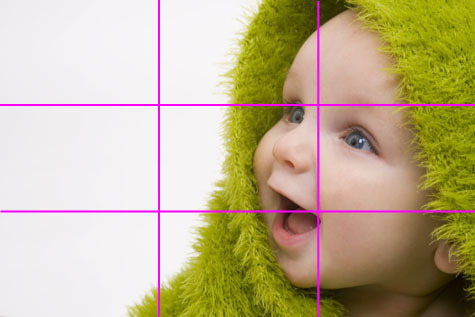 The rule of thirds is applicable to each format in Photography Film or Sensor or Output, which can also square or panoramic, each time, it is possible to divide the image into thirds with the lines of force. Rule of Thirds is only one of the major element in composition. There is a mathematical relationship of Golden Section and Rule of Thirds. The sharpness setting aids many cameras in the center of the viewfinder to be intuitive and very often the main subject is placed in the center. Such photos often seem little harmony, boring and static, the rule of thirds is used as a simple tool to prevent this boring issue. As with all design rules, the rule of thirds is always the motive and intent of making it better, breaking rules deliberately can lead to better pictures depending upon the situation. Rule of Thirds in Portrait. We can use electronic grid overlay on LCD screen of Digital Camera to make Rule of Thirds real not imaginary. 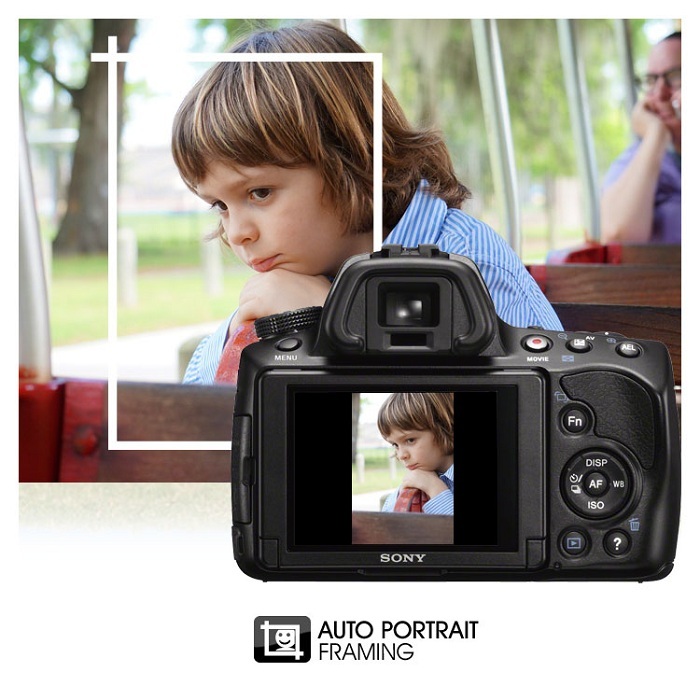 We can take multiple shots with a digital camera which costs nothing in comparison to films. We can post process ourselves to cut an image in Adobe Photoshop or any other advanced image editing tool to force Rule of Thirds after actual image shooting. This Article Has Been Shared 6418 Times! Cite this article as: Abhishek Ghosh, "Rule of Thirds in Digital Photography," in The Customize Windows, October 13, 2012, April 21, 2019, https://thecustomizewindows.com/2012/10/rule-of-thirds-in-digital-photography/.